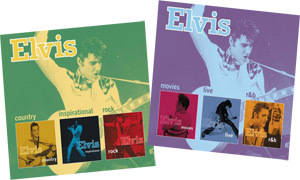 These are the covers of the two three CD re-issue boxes containing the six "Genre" compilations "Live", "Rock", "Inspirational", "R&B", "Movies" and "Country". These sets will be available October 13, 2008. How low can this company go? Maybe in a couple of more months a repackaging of the 6 titles in a foil. Any suckers that have these titles gonna buy this? These did not sell well the first time so I just don't get their rationalization for the re-release? If McCain or OBama can answer this one he gets my vote. These didn't sell the first time around and were 'remaindered' at my local HMV (half the price about 2 months after release). Why are the greedy gits putting them out again? They do not have a clue. Result? The Elvis catalogue is in a shambolic state. reissuing these so soon.... flooding the market only means less sales; guess they will milk the cow till the milk runs dry! shame bout that! are these available at K-Mart?..